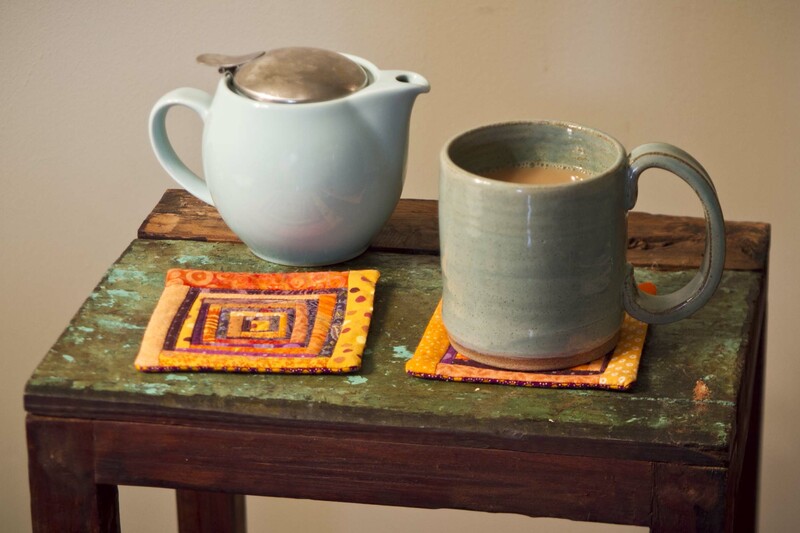 My mom, my sister, and I took part in a quilt challenge called Stretching Art and Tradition. It’s an annual challenge, but this is the first year we’ve participated. The deadline for sending the finished quilts in was this week, and I sent mine off over the weekend. 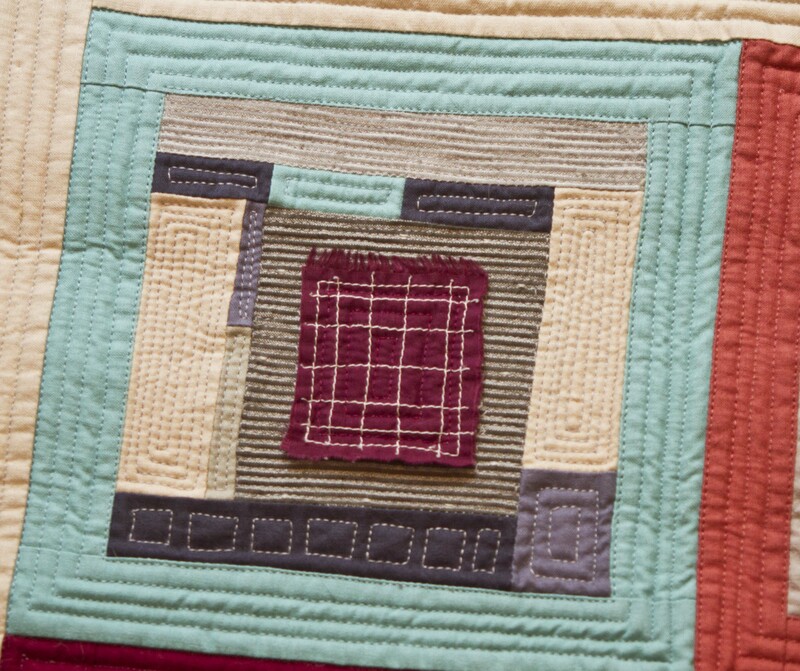 The quilts will all be shown at the Quilters Heritage Celebration Show in Lancaster PA. I took some photos before I packed up the quilt, so I thought I would share them. The theme for this year’s challenge was “Foundations of …”, and you could choose how to fill in the blank. I decided to go with the theme “Foundations of Liberation”. I interpreted this theme a few different ways in the quilt. 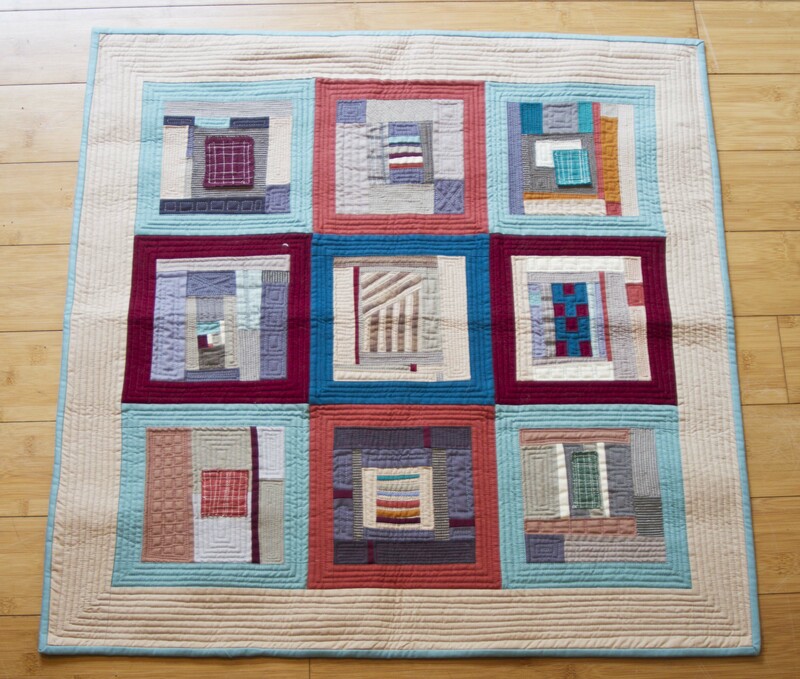 My favorite type of quilting is called “liberated quilting” inspired by Gwen Marston‘s book “Liberated Quiltmaking” as well as the work of Jean Wells, and the amazing Gee’s Bend quilts, which I just love. 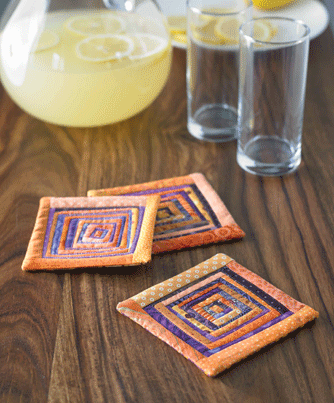 My mom first introduced me to this style of quiltmaking, and it’s really become my favorite way of designing quilts. It’s a really intuitive process that I enjoy. 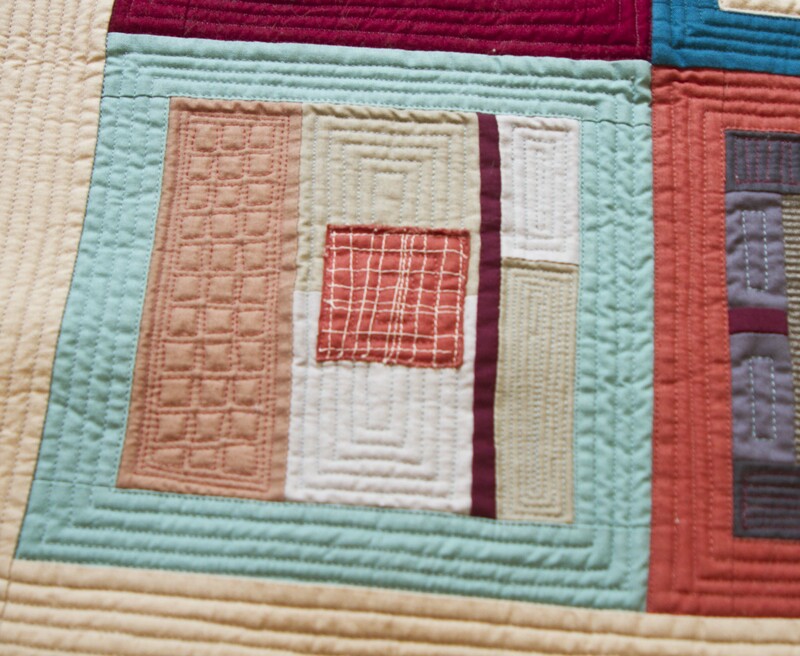 The designs in the quilt are loosely inspired by the views of crops and fields from a plane window. I visited my sister in California back in May. I knew that I would be starting work on this challenge during my vacation. I knew the theme I wanted to work with, but I didn’t know exactly what I wanted to create. Staring out the plane windows on my flight to CA provided plenty of inspiration! This ties into the theme of liberation, because when you’re flying in a plane looking down, designs emerge that you would never see from the ground. The change in perspective allows you to see patterns that you wouldn’t otherwise see from your normal day to day perspective. I used this as a visual representation for things like racism, sexism, ageism, or homophobia. These ‘isms and phobias tend to be invisible unless you have the perspective of someone who experiences them in your day to day life. This change in perspective, whether it’s looking at something familiar from a new angle, or shifting the way people perceive you in the world, is in a way liberating. I don’t think all of this comes through just from looking at the quilt, but that wasn’t really my intention. I didn’t want it to be too literal. This is just what was floating around in my mind as I worked on the design. 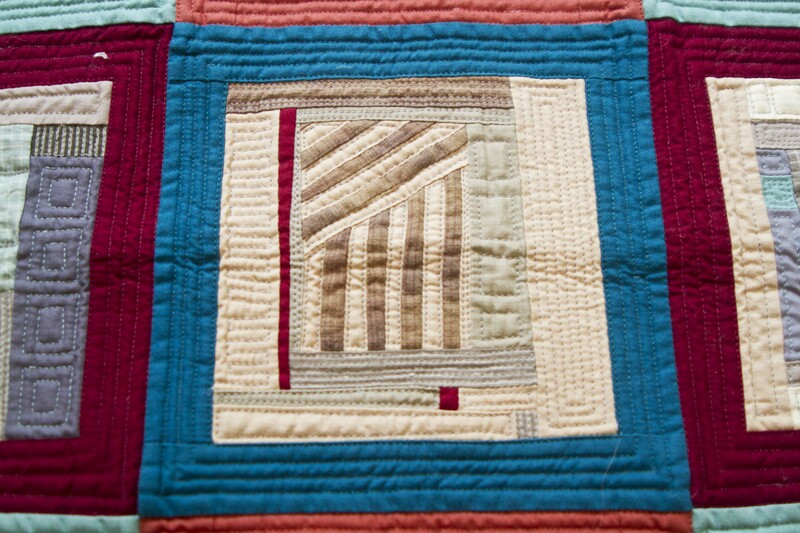 Visually I tried to keep with the crop/field theme in terms of the shapes I used and the quilting designs, but I didn’t confine myself to using colors that you’d find in a field. I’m glad to have this quilt finished, and to have met the deadline! It took many hours of sewing, but I’m happy with the way it turned out. I’m looking forward to making more quilts inspired by views from a plane. I’ll be traveling soon for work, so it will be a good way to pass the time coming up with more design ideas!